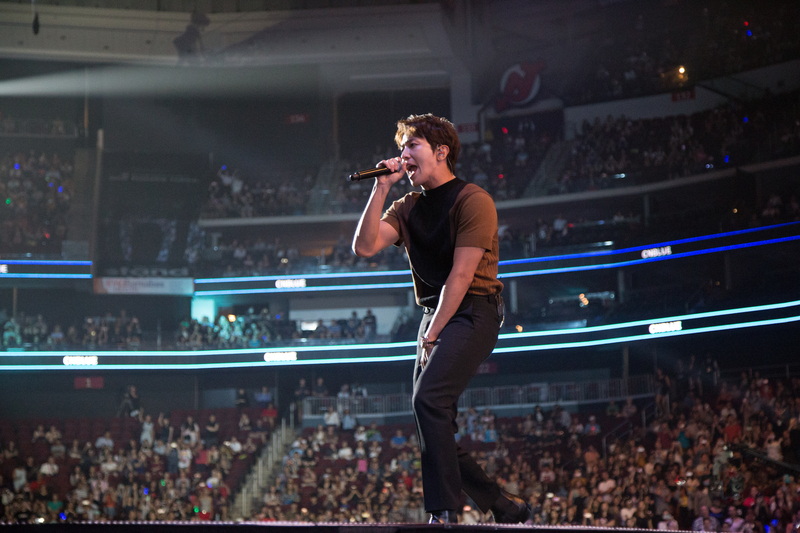 The annual pilgrimage to the Prudential Center in New York’s metropolitan area continued for East Coast K-pop fans last weekend when KCON 2017 NY presented by Toyota came back for another two nights of unforgettable M! Countdown concerts. For those who missed out on the polished choreographies, dazzling visuals, and the A1 fan service from the night prior, Day 2 (June 24th) definitely was slated to make up for it. The turnout to catch a few glimpses of UP10TION, NCT 127, Twice, and CNBLUE visibly exceeded the numbers from the first evening, despite being short an act. Before the show even hit the road, it seemed like concertgoers were due for something exceptional. The pre-show officially launched with the entrance of the man who needed no introduction, violinist and YouTuber Jun Curry Ahn. Ahn, who has been a mainstay to the east coast leg of KCON USA since its inauguration back in 2015, delivered a heartrending stringed performance of Crush’s “Beautiful” of Korean tvN drama Goblin fame, before moving onto the equally poignant “Spring Day” by BTS. The balladry did not last for long, however, as Seoul-based dance crew 1Million Dance took to center stage immediately after, popping, locking, and getting intimate to Jay Park, BoA, and many more of Korea’s chart-toppers. The chemistry and coordination between the team members – who were also tastefully dressed in matching reds, whites, and blacks – had already commenced the night on such a high note. Ahead of their appearance as CNBLUE, lead vocalist Jung Yonghwa and bassist Lee Jungshin came out to introduce the main event, the first set of which was a sudden special homage from Twice to their company figurehead/producer Park Jinyoung (better known as JYP). Twice is just the latest out of a chain of popular girl groups created by Park, and the lone ladies of the night paid tribute to senior group miss A’s “Bad Girl, Good Girl” and clapped along to the point choreography of the legendary “Nobody” from Wonder Girls to a standing audience. It is inevitable that someday they too will be indicted in JYP’s femme fatale hall of fame. Rounding out the medley, they even threw it all the way back to JY Park’s 1988 funk hit “Honey” for the millennial crowd. I would like to think that somewhere out there Papa Park was breaking out into the signature eye-vanishing grin of his at the sight of his girls doing his song justice. Up next were the nine boys of UP10TION (member Wooshin is currently on hiatus due to mental health concerns), who seized the moment and delighted the public with the yet-to-be-released trop house “Runner” for the first time. As much as it was an honor to be privy to such an exclusive opportunity, it must have been an even greater one for the group to perform for the first time in America. After the usual rounds of introductions, they defaulted on their debut single “So Dangerous” and took advantage of the extended stage during “Attention” in order to finally meet their American fans. And although it would not be the last that concertgoers would be seeing them, the members seemed disappointed that their selective set list was coming to a close with their most recent single “White Night.” All the while, they were unable to hide their enthusiasm at being able to perform at the A-list event in front of thousands, waving to the audience whenever available. Turning the typical, seniority-based KCON structure on its head were the guys of NCT 127, who followed UP10TION’s set in spite of the additional year of experience that the latter had on the former. A crazed Taeyong set the stage in a dramatic dance routine to a chant-like soundtrack while the other members filed in from the sides of the stage shortly before joining their leader. Their lofty entrance transitioned smoothly into the sounds of sirens accompanied by the three words that every individual love to hear, a “Get It Lifted” in baritone. “Firetruck” was about as atonal live as it is in its studio version, and the fans absolutely loved it. Amidst all the whoops and distortions, it is the kind of sonorous mishmash that can grow on a listener after much desensitization, which is certainly the case in today’s experimental soundscape. Members Johnny and Doyoung, who had scurried off backstage at the start of the trap influenced hip-hop number, reunited once more to greet fans for the first time since taking the spotlight and to help out with the rest of the setlist, which included the B-sides “Good Thing” and “0 Mile,” which are typically are rare at KCON. They also managed to work in “Limitless,” a single that is august on its own but is shadowed by their more music-forward tracks, before a love song mission and before Johnny took the mic to initiate a warm call-and-response, “When I say cherry, you say bomb,” as segue into said music-forward track. Yes, fresh off the press was “Cherry Bomb,” a rather drawn out title that tries to be multiple songs at once in the most harmless way possible. Albeit “Cherry Bomb” has less of an obvious format than its close cousin, “Firetruck,” it edges the latter out by successfully doing the unconventional with its addictive, staccato hook, backed with bold claims (“I’m the biggest hit on this stage”). The leg-splitting choreography would be the highlight, but the members’ smoldering gazes which never once broke character simply cannot be overlooked, either, especially Yuta’s intense glower. Where are the boys next door who were just serenading a fan with B.o.B’s “Nothin’ on You” five minutes ago now? In accords with the musical themed special stages from Day 1, the second day had its share of witty K-pop meets Broadway encounters as well. UP10TION returned to perform their rendition of the Mamma Mia version of ABBA’s “Honey Honey ” which has to be a pun on their fandom name, Honey10. Their routine was something out of a theater show, completed with feet clicking, straw hats, and line dances, while their vocals were pristine as always. Unlike their usual no-nonsense choreographies, this was certainly a more refreshing departure, and the bounce in their step seemed to agree. But back to the regularly scheduled program. With only the headliners and Twice left, fans already started to abandon their seats for standing in anticipation of the nation’s little daughters. A screen displaying images of star clusters and other heavenly bodies gave way to the nine women adorned in white, and foreshadowed the forthcoming song, their latest single featuring an alien-inspired concept, “Signal.” They then did ”Cheer Up” and “TT” back to back. Twice’s legacy lies in their iconic, simple-to-follow point choreographies, and whether it is their adorable “Sha Sha Sha” of the former song or the pouty “I’m like TT” from the latter, pretty much everyone that evening were following along. The only gripe with their set was that it would have been more memorable had they saved their most lauded songs for the finale. Instead, the girl group opted for “Knock Knock,” a blithe masterpiece that deserves better than falling flat next to the record-breaking “TT” and “Cheer Up.” Overall, the performances from the adored girl group adhered closely to the books, notwithstanding the tremendous outpour of love they were receiving from supporters in the stands and pit. If I’m honest, when KCON first unveiled CNBLUE as headliner, it felt like they were really scraping the bottom of the barrel. The band is not as popular as they once were, so the worry that they would not have a strong presence was always there. With something to prove, however, these seasoned artists absolutely blew these misconceptions out the window; the guys did not come to play. As the conclusion drew near, the ever multi-talented Yonghwa then retreated to the main stage to boast his sharp piano skills during “Can’t Stop,” where he continued to deliver impressive notes, neck veins and all. I must really commend him for being able to carry most of the vocals for the team, an undertaking customarily divvied up among the members of a K-pop group, and still be able to beam as wide as he did. Before bringing it down some notches with the mellow “Love Light” and signing out, he promised to come back soon. And if the merry atmosphere that still lingered in the air post-CNBLUE or the ovations given to the occasional shots of the drummer-by-day-pretty-boy-by-always Minhyuk were any indications of their high demand, hopefully he is right. 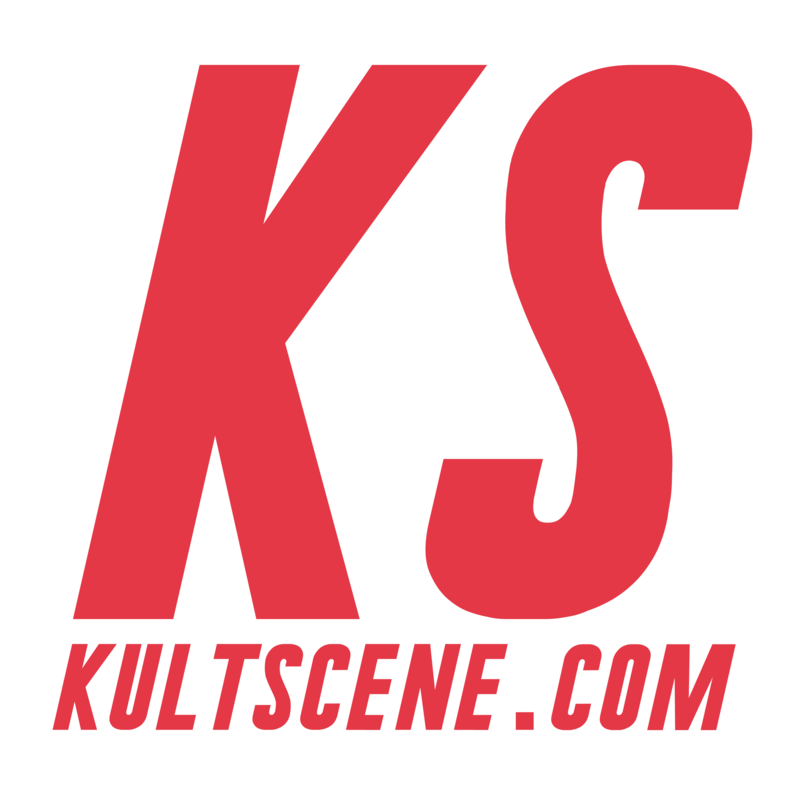 Before convention attendees and concertgoers knew it, it was time to bid farewell to yet another installment of KCON NY. This year’s M!Countdown stages provided numerous underrated acts with a chance to shine, while always exceeding expectations and managing to outdo the ones from previous years. The mothership of all things Hallyu will continue in August when KCON returns to LA on the West Coast for their homecoming, and we already cannot wait. Did you attend KCON 17 NY? What’s your favorite KCON artist? Let us know in the comment section below and be sure to subscribe to the site and follow us on Facebook, Twitter, Instagram, and Tumblr to keep up with all of our posts. 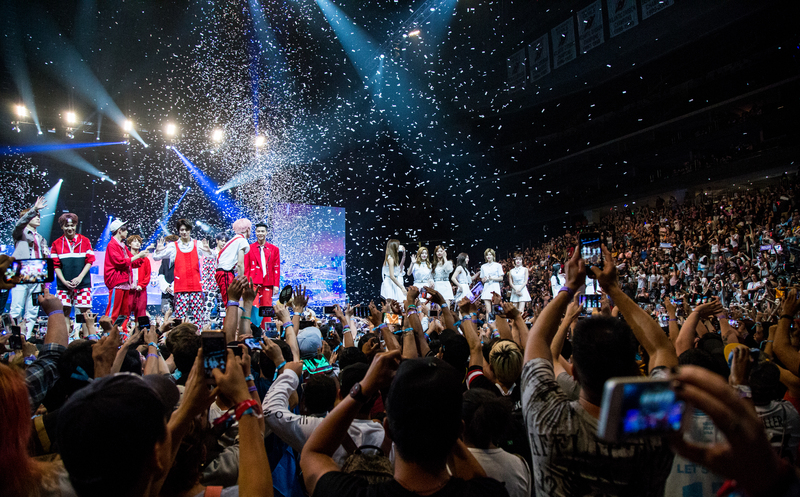 Almost exactly one year since it last hit the Prudential Center in New Yorks’s metropolitan area, KCON 2017 NY presented by Toyota returned once again this past weekend (June 23 and 24) for another two nights of star-studded M! Countdown performances. The Day 1 concert had rookie groups KNK and SF9 dancing on the same stage as the veteran “super rookie” group Highlight. Meanwhile hip-hop and R&B soloist Zion T. and girl group GFriend added diversity to the forever testosterone and pop-heavy lineup. For some of the artists, it was their first time performing stateside altogether. But for all, their participation marked their debut onto the annual cross-cultural East Coast music festival scene that continues to bring the most devoted Hallyu fans out in droves. Not soon after concert goers filed in to occupy the arena seating and pit to catch the preshow – a fan dance battle moderated by special guest and former U-Kiss member Kevin Woo – had it been already time for the main event of the night. 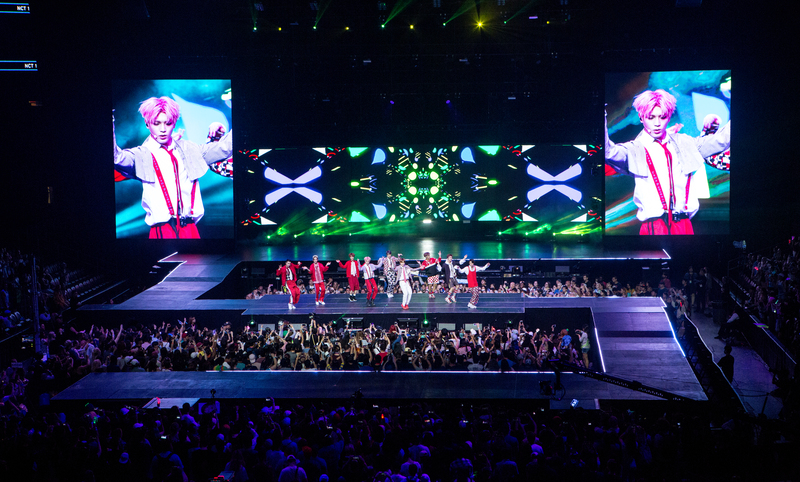 At promptly 7:30 PM, the show kicked off with its trademark “Let’s KCON” motto. Ascending in front of a very fitting backdrop of nebulae and celestial bodies, the vertically superior KNK opened with their most recent single “Sun, Moon, Star,” a song which they later explained was about broken up lovers. The quintet delivered the anguish that such a song demands, and decked out in resplendent white suits, they looked and sounded like they were not only a year into their careers. This only became apparent once they moved on from their debut song “Knock” straight into their already final track “Day N Night,” reminding audiences that their discography still has room to grow. The latter is a personal favorite, and since it was never promoted as a single, was a pleasant surprise to their terse setlist. I think lead rapper Heejun was doing all of us a public good when he put up his own mic to lead vocalist Youjin when he hit that high note during the bridge. It really would not be a KCON without its collaborative stages, and this year seemed to have been Broadway musical-themed (a tip of the hat to good ol’ New York City) as Yuju of GFriend and Dongwoon of Highlight united in a rendition of Beauty and the Beast’s “Tale As Old As Time.” It was definitely an oicwydt moment seeing the gorgeous GFriend member work in perfect harmony with the former “Beast” member. The no-frills duet relied solely on their immaculate vocals, all the while keeping the number subdued without sounding boring. Up next was SF9, a boy group who I admittedly made the mistake of overlooking going into the concert. From the moment they set the venue aflame with their latest song “Easy Love,” the amount of proud fans clothed in unofficial merchandise and holding up support banners for the group who have not even seen their one year anniversary yet just made sense. The first real “dance” group coming out of FNC Entertainment, an agency typically known for their favoritism towards bands in the truest sense of the word, they did not disappoint. 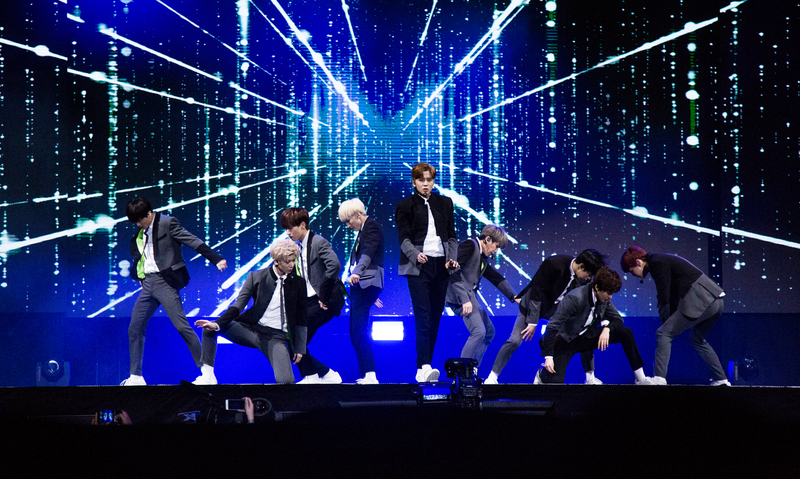 How they are able to execute their razor-sharp choreography without sound breathy is still beyond me, and after seeing the nine-piece group perform in the flesh, I can affirm that the aphorism about how one does not learn to appreciate a song until it is done live was about SF9. The girl group representatives of the night, GFriend (sans Yerin who had individual schedules overseas), made their entrance with a powerful dance break in their signature uniformed-inspired look, compensating for KCON’s serious dearth of female acts. They continued the trend of opening with the most recent single and plunged right into disco and synth blend hit “Fingertip.” An exciting song to match the equally high-spirited mood. Unfortunately, as the proceeding “Navillera” transitioned into “Me Gustas Tu” into “Rough,” the rest of their set felt a little like one mega ditty playing up the naiveté of youth rather than three separate and unique songs. Not hating the high school concept trilogy, it’s just that a better setlist that showcased greater variety or another song inter-spliced between the ones could have avoided this misfortune. That aside, audiences still received kindly to the more than stable vocals, synchronized dances, and charms of these girl crushes. It’s always interesting to see how a solo artist can manage to keep the momentum of crowds going, and with no group dynamic to fall back on, the pressure is certainly on. But Zion.T, draped in what looks like could be his dad’s baggy suit and traipsing his way towards a grand piano, exuded pure professionalism and cool, calm collectedness not witnessed in other acts seen thus far. There, he introduced “Complex,” before moving onto “The Song” off of the same OO album. He already impresses with his distinct voice and frictionless croons, but when he brings out his inner rapper as well, he’s just being unfair. The man also displayed a subtle sense of humor when he inquired if audiences knew his penultimate song for the night, “Eat” (“you know, like yum, yum, yum eat?”). Unsurprisingly, he closed with the iconic “Yanghwa Bridge,” a sluggish track that is perfect for not only evening commutes home, but also for bringing together a group of disparate peoples in chorus. Not a single person in attendance was not singing either “haengbokhaja” (“Let’s be happy”) or “apeuji malgo” (“Don’t be sick”) of the lyrics’ sweet words to his family. Zion.T’s strength lies in the fact that his slow-tempo songs always have those couple of phrases that are easy to follow along, guaranteeing audience participation. He knows this too as he played conductor, and took advantage of the whole extended stage. Only Zion.T could ever do what Zion.T does best. The show could have concluded right then, and everyone would have been okay with it, however it did not. 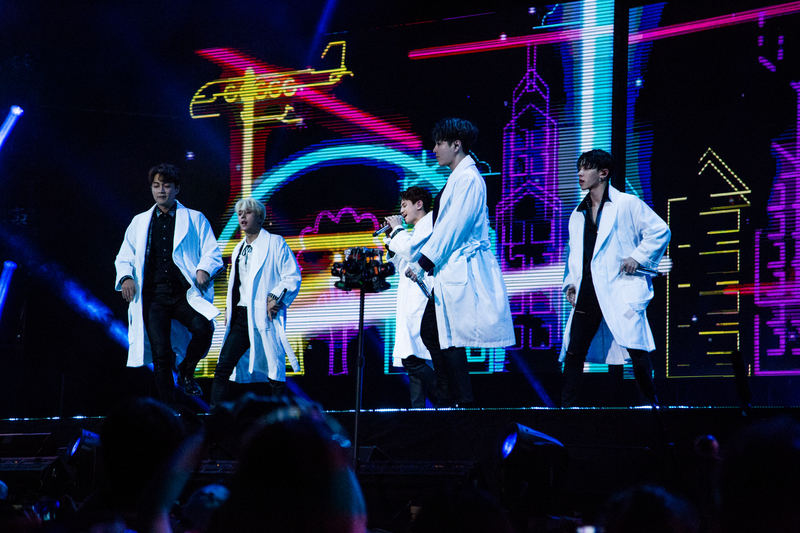 SF9 reappeared onto the stage for an unexpected special performance of EXO’s “Call Me Baby” and BTS’s “Boy in Luv,” which was probably KCON’s way of saying “Hey, I know we could not give you guys the two hottest K-pop groups at the moment, but here’s a cover.” In any event, audiences welcomed the familiar tunes and dances in vociferous cheers. Rounding off the first night was finally Highlight, who hit the ground running with “Plz Don’t Be Sad.” Outfitted in white long coats with personalized names on the back (Dongwoo’s appropriately had “Guapo” monogrammed), they had as much fun with the performance as audiences did dancing along to the ridiculously fun hook. It was not even their last song, but streamers already rained down as if it was. Though “Calling You,” the group’s most recent release, was another obvious pick, it felt lowkey and paled in comparison to the former song. I would rather they have traded it out for “Can You Feel It?,” the eponymous track off of their first album post-rebranding, which would have offered tighter cohesion considering the other dance songs of the headliner’s setlist. That, and I just would have really like to see “Can You Feel It?” live once, you know? After exhausting their narrow discography as Highlight, the second generational group moved older fans with “Yey,” one of their more underrated bops that had the crowd on their feet even if they did not agree in the fine workmanship that went into producing the EDM track. They dug back further in their bag of tricks to also unveil the 2014 hit “Good Luck” and 2012 summer anthem “Beautiful Night,” which best describes what the evening was after their stellar performances. They had nothing but their fans in mind as they switched between their parts and tossing out plushies and taking selfies with the phones of some lucky individuals. A personal aside, but it brings me immense joy to know that a group that was once upon a time my first bias group still got it. Beast or Highlight, this is a band that simply knows what it takes to put on a show. And like that, the night had finished without a hitch. Though Day One of the two-part event was now officially over, there was still a Day Two to go to. While fans were entertained by the mirthful pop songs, intricate choreography, and earnest attempts at communication of the artists, they were already looking forward to what was in store for the upcoming day. After all, what better way to fill the void left behind by post-concert depression than with another concert?